Does your organization ensure that all leaders/managers and supervisory staff are trained and are knowledgeable about respectful and inclusive workplaces? 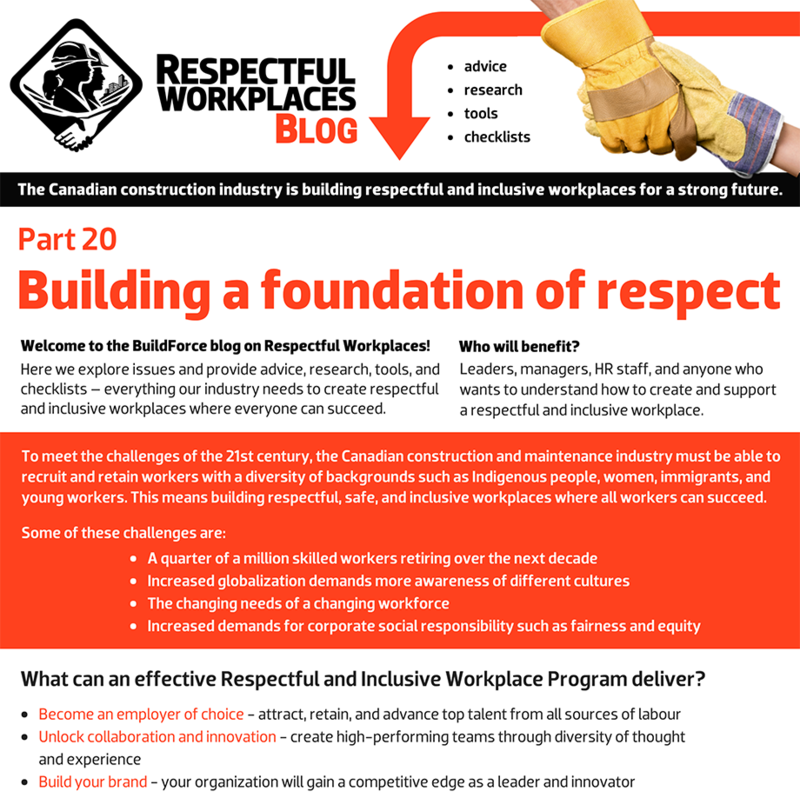 Respect and inclusion is a multi-faceted topic; people have questions and complex situations arise in the workplace. What can you do to ensure that leaders/managers and supervisors are knowledgeable and continue to learn? Training only at the outset of an initiative will not ensure that attitudes and behaviours change. Multiple training channels ensures that respect and inclusion is not a separate, isolated initiatve, but is part of how the organization operates. Training can be formal and informal; e.g., principles and expectations should be clear in orientation manuals/training; tool box talks, lunch and learns; in classroom, online course and social media. Training should be part of an ongoing strategy. BuildForce Canada. 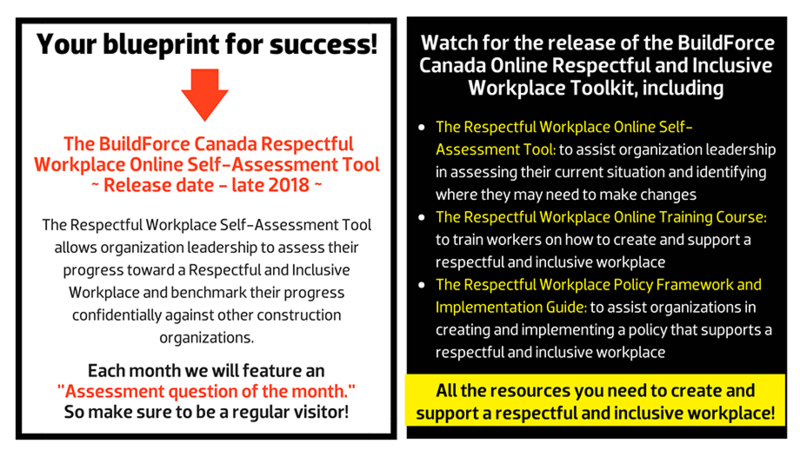 Online Respect & Inclusion Toolkit. Release Date: late 2018. BuildForce Canada. 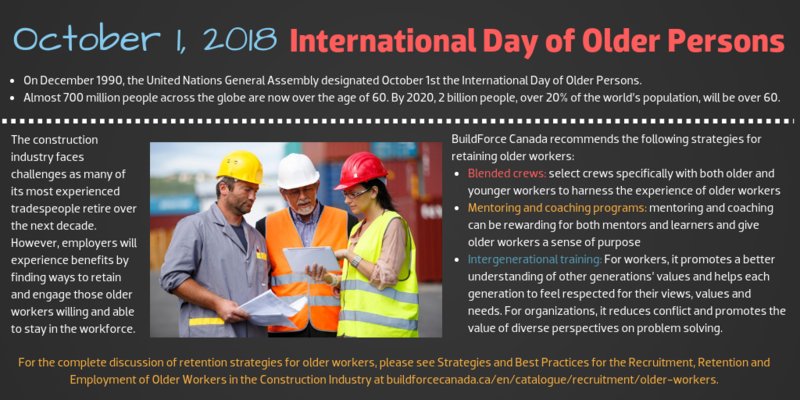 Strategies and Best Practices for the Recruitment, Retention, and Employment of Older Workers in the Construction Industry. 2011. See buildforce.ca/en/catalog/recruitment/older-workers. Newsweek Vantage. Achieving Results: Diversity & Inclusion Actions with Impact. 2017. See newsweek.com/diversity-inclusion-actions-impact-download-workplace-articles-study-689453. Accessed January 14, 2018.